Maddie Slater reaches for a block. The senior middle blocker and the Wildcats earned a win in their final home match of the season. In a season wrought with struggles, Northwestern found a storybook ending to its seniors’ careers at Welsh-Ryan. The Wildcats (9-21, 2-16 Big Ten) conquered Maryland (11-19, 3-15) on Saturday in straight sets, 26-24, 25-22, 25-21. The win came a day after NU fell at home in four sets to No. 24 Ohio State (18-12, 8-10), 25-23, 23-25, 21-25, 21-25. Coach Shane Davis said Saturday’s win was the perfect way for the team to close out this season’s home games. The Cats started Senior Night off strong with aggressive serving and a relentless attack. They cruised to an 18-11 lead, but the Terrapins fought back into the set, eventually tying the score at 22-22. NU persevered through its opponent’s rally, though, and earned the first-set win with an ace by junior outside hitter Symone Abbott. Abbott finished with 16 kills in the match. Senior outside hitter Sofia Lavin added 13 kills while hitting .310 in her last home game. Lavin said the feelings from the dominant Senior Night win were hard to put into words. The second and third sets were much more back-and-forth than the first. Though both teams fiercely competed, the Cats once again overwhelmed Maryland with their serving and dynamic, balanced attack. NU had three players tally a .300 or higher hitting percentage in the match. Senior middle blocker Maddie Slater notched four kills, and senior outside hitter Kayla Morin had seven of her own. The team’s strong defensive presence also helped it seal the sweep. The Cats had 55 digs in comparison to the Terrapins’ 43. 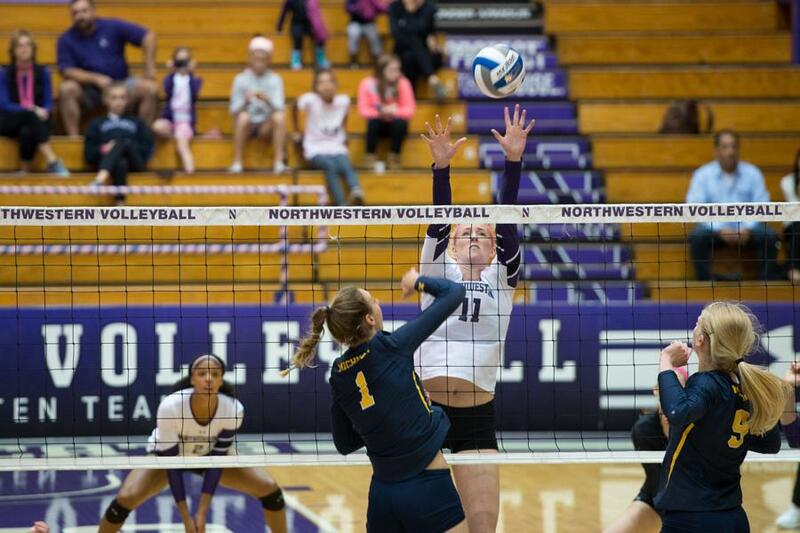 Freshman libero Sarah Johnson earned 13 digs for NU, and senior setter Caleigh Ryan had five. Ryan said the Cats’ strong serving allowed them to execute the rest of their game plan. NU recognized six players on its senior night: Lavin, Ryan, Slater, Morin, outside hitter Rafae Strobos and sophomore libero Katie Kniep, who is retiring from volleyball due to injury. Although the team ended its home campaign on a high note, it will travel to face No. 15 Penn State and Rutgers this upcoming weekend. The Scarlet Knights, winless in the Big Ten, might not be a daunting opponent for the Cats. But the Nittany Lions, one of volleyball’s perennial powers, decimated NU on Sept. 25. The task against Penn State is one the Cats believe they can take on. Ryan said the team is as confident as ever heading into the last week of its season.